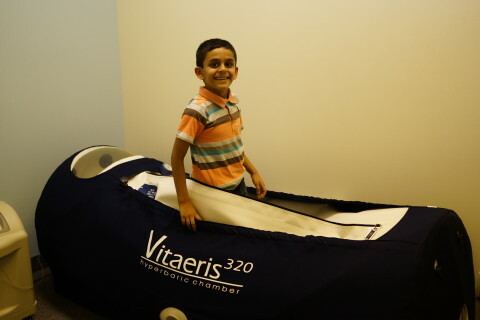 Hyperbaric Oxygen Therapy (HBOT) uses an increase in atmospheric pressure to allow the body to incorporate more oxygen into blood cells, blood plasma, cerebral-spinal fluid, and other bodily fluids. This therapy may be used as a stand-alone treatment or combined with personalized treatment plans for a variety of conditions, including 13 conditions** officially recognized by Health Canada. Originally HBOT was invented to treat decompression sickness and carbon monoxide poisoning, however since it has been adapted to treat a wide range of medical conditions, many of them neurological (please see the list on right hand side of this page). At Revivo Neurology Treatment Centre, we also use Hyperbaric Oxygen Therapy as a supplement to Suit Therapy as well as to traditional physiotherapy (PT) and speech language pathology (SLP). 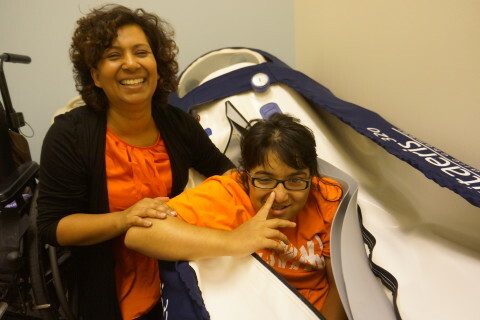 Our HBOT prices start at only $59 per 60-minute session! Exact cost of the programme you’d opt for depends on number of sessions in your booked package and duration of each session. Read our publications on how Hyperbaric Oxygen Therapy may be beneficial for some of the medical conditions listed on the right hand side of this page. Should you get interested in obtaining more information on HBOT research and how it could help with your specific condition, please contact us and we’ll do our best to provide you with extra guidance. By placing someone under pressure in a hyperbaric environment, there is an increase in the gas pressure forced into the lungs. This increase in gas pressure, increases the partial pressure of the oxygen gas, and thus forces more oxygen to be dissolved in the plasma. This saturation of oxygen in the blood allows the extra oxygen to be diffused or transported to the surrounding body tissues promoting a healthy, healing environment for the body. Additionally, it can increase the effectiveness of some antibiotics and stimulate new blood vessel growth to increase circulation in areas of poor circulation. Typically, some improvement could be observed after 10 sessions of 60-90 minutes each, particularly improvement of sleep. More evident results are observed after 40-120 treatments, depending on severity of the condition treated. A very small risk of seizure exists when using hyperbaric oxygen therapy. Such risk could be minimized if lower pressures are used and session times are shortened to 45 minutes instead of 60 minutes. Some patients experience ear pain, similar to feelings experienced during descent in an airplane. Ear pain symptoms could easily be reduced by yawning and swallowing in order to equalize the pressure in the ear drum. HBOT may cause temporary near-sightedness, and may accelerate cataract development. – thermal burns (e.g., from fire or electrical sources).